With over a year and a half into our Agile journey here at Valpak, now was the right time for our first ever hackathon. So, hack we did! Since we were indeed hackathon virgins, we sought advise from our sister company, Savings.com, who has been doing quarterly hackathons for quite some time now. Being a West coast startup, they are much closer to Silicon Valley than we are, so they obviously caught the hackathon bug a lot sooner. Our friends at Savings.com provided lots of insights from their past experiences but the most important takeaway was to make sure to “have fun”. So, fun we had! Coincidentally-on-purpose, we scheduled the hackathon kick off to directly follow a long-awaited IT organization cookout and kick ball game at the park. The teams were so amp’ed up from playing kick ball in the park that the kick off was extremely spirited, to say the least. So, kicked off we were … with kick ball! By 3:00pm that Thursday, we all piled into our largest conference room (body odor and all) and all 13 teams got up one by one to introduce their team and describe their idea. We had ideas running the gamut from utilities to help us save time to widgets and apps that will amaze customers to an entirely new platform architecture using up and coming technologies. Immediately following the kick off, teams began hacking away at their ideas. So, hacking we did! Teams had from about 4:00pm Thursday to 9:30am Monday to get as far along as possible on their ideas (teams could and did hack through the weekend if they chose too). Teams were also able to work wherever they chose during the hackathon, office, home, a pub, wherever. During the hacking period, the Software Engineering Director and the Architect made rounds to keep teams “unstuck” (that was another wise tip from our Savings.com pals). Also, several of us leaders made sure that the teams were well fed and hydrated with everything from Krispy Kreme to pizzas to Red Bull and of course we had lots of leftovers from the cook out too. Monday morning rolls around and all 13 teams … Vicious & Delicious, Darth Vatr, A-Hacker, and so on … take their turn at the podium to demonstrate what they accomplished to a panel of judges and a room packed full of eager stakeholders. The judges were the President of Cox Target Media / Valpak, the CIO (my boss), the Digital Innovation Director, and the Software Engineering Director. The judges awarded trophies for Best Innovation, Ready For Primetime, and Nice Try. Everyone was absolutely blown away! 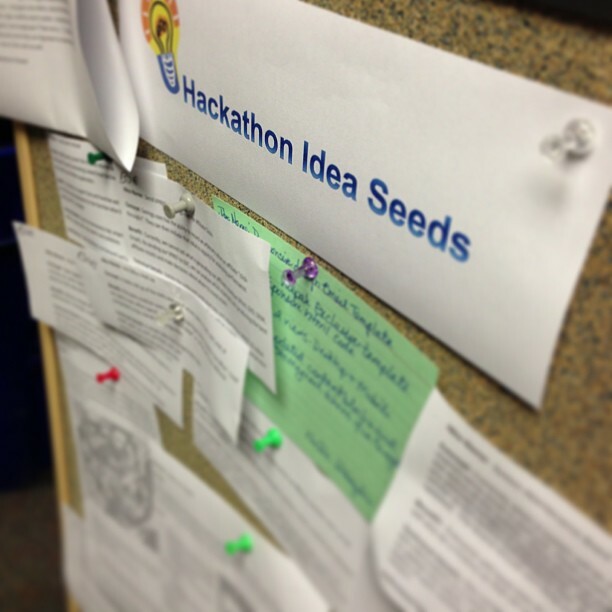 All 13 ideas were viable and most teams achieved what they set out to accomplish, and in such a short time frame too. As I look back on our first ever hackathon experience, I can’t help but think that so much of this was made possible by Agile … our culture, our mindset, our values. Under the old waterfall world, we would have struggled to self-organize around a thing like a hackathon, not to mention the nightmare logistics of disrupting multiple conflicting Gantt schedules with mobs of anxious stakeholders waiting at the end of a death march. In the old days. we were used to being told what to do by a document or by management. Self-organization didn’t come easy to us back then. We were waterfall zombies! We didn’t have the capacity to dream up new ideas and we certainly didn’t have the autonomy to hack away at them. The hackathon was our opportunity to truly practice our new found autonomy and that we did…. people picked who they worked with, what they worked on, when they worked, where they worked, and how they worked. Oh the times they have changed! While there are some things that we might change the next go round, like not scheduling over Mother’s Day weekend or maybe mandatory deodorant after kick ball, what we we did was hugely successful and ultimately fun too. I, for one, can’t wait for the next one!